This 10,000 RPM Random Orbital Sander is self-vacuuming and has a 6-hole hook and loop sanding pad. Average air consumption is 2.8–4.5 CFM at 90 PSI. 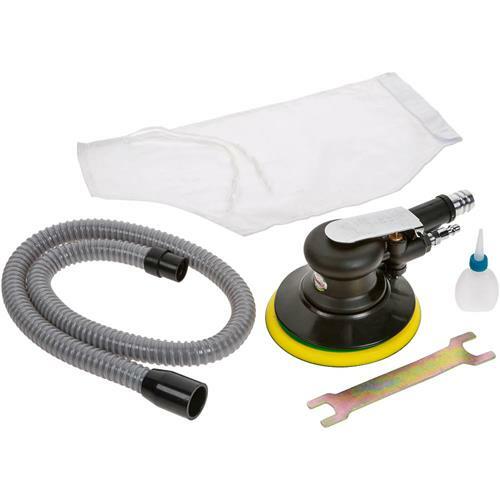 The sander also comes with a 1/4" NPT male quick connect coupling, dust collection bag, wrench, and oil. Sander weighs 2.53 lbs. I bought this about 18 months to 2 years back. I liked it and thought it was a good product, but ultimately sold it on eBay and replaced it with a 5" orbital sander from Dewalt. These were my issues. The connector for the air hose is too close to the vacuum port and at times it was hard to connect. Also, there is no master switch and at times I found that I would inadvertently turn it on when I was connecting the vacuum hose or replacing paper. Also, it's a 6" sander and the paper is harder to find than the 5". And finally, with the sander running, the air compressor running and the vacuum running there was just too much noise. With the electric orbital you only had the sander to contend with or the vacuum if you choose to go that route. Ya, I get that> I just bought one and find it hard to find discs now! and yup, that air inlet is awefully close. Live and learn.